The clinic includes 3 overnight stays. The delicious meals start with dinner on the first evening and end with breakfast on the last morning. ​​​You will work with our herd of horses. It is not an option to bring your own. The clinic does not involve riding horses. 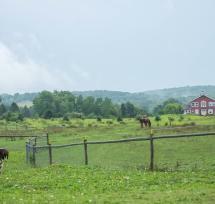 During the clinic no other guests but Paula and the participants will stay at Mountain Horse Farm. For sleeping, you have your choice of elegant rooms with fireplaces and outdoor hot tubs, to glamping in tipis (yes, tipis!) – your choice. The maximum number of participants is kept low at 10 and we don't accept auditors. You will be required to sign waivers. Make sure you wear shoes with closed toes (no flipflops, slippers or sandals) and it's always a good idea to dress in layers. ​ Mountain Horse Farm is located in the beautiful Finger Lakes region, famous for its wineries and breweries, gorgeous lakes and waterfalls. You may want to consider adding a few days to your trip to explore the area.